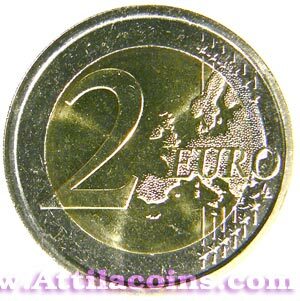 Euro-area Finance Ministers endorsed on 17 January 2011 the issuance in 2012, by all euro-area Member States, of a commemorative 2-euro circulation coin with a common design to mark 10 years of euro cash. Citizens of all Member States of the euro area were invited to submit designs via a dedicated website during a three-week period in May 2011. A professional jury selected five from among the more than 800 designs submitted. Euro-area citizens and residents therefter selected the winning design by public web-voting in June 2011. The results for each of the five designs and the names of their creators are indicated below. 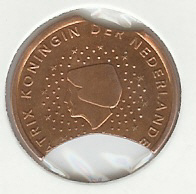 In January 2012, the seventeen euro-area countries have jointly issue the commemorative euro coin to celebrate ten years of euro cash. Regardless of which country issues the coin, it will bore the same design on the national side, normally reserved for a motif specific to that country. This is the third time the euro-area members have decided to collectively issue a commemorative coin. 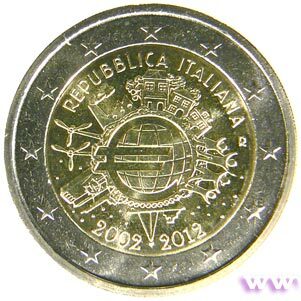 The first was in 2007, when the finance ministers of the then thirteen countries agreed to celebrate the 50th anniversary of the Treaty of Rome with a single commemorative coin and the second time was in 2009 when sixteen countries celebrated 10 years of the EMU. The Euro-sign in the centre of the coin shows that the Euro has become an element of particular importance in Europe as well as all over the world as the Euro evolved to a global player in the international monetary system in the last 10 years. The design elements around the Euro-symbol on the coin express the importance of the Euro to the people (family of four), to the financial world (ECB tower), to trading (ships), to industry (factories), to the energy sector and research and development (wind power stations). It was created by Helmut Andexlinger who is a professional designer at the Austrian Mint. The artist's initials, AH, appear below the image of the ECB tower. The name of the issuing country in the national language: «REPUBBLICA ITALIANA» appears at the top, while the years 2002-2012 appear at the bottom. According to the European Central Bank the winning design symbolises “the way in which the euro has become a true global player over the past 10 years, as well as its importance in day-to-day life”.